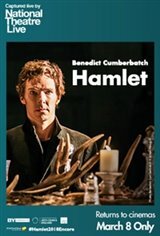 Fathom Events, BY Experience and National Theatre Live present Hamlet, featuring Academy Award®-nominee Benedict Cumberbatch in the title role for a special one-night cinema event returning to select cinemas on Thursday, March 8, 2018. Originally captured at the Barbican theatre in London in 2015, the production was directed by Lyndsey Turner, produced by Sonia Friedman Productions, and tells the story of a son who is forced to avenge his father's death but rages against the impossibility of his predicament, threatening both his sanity and the security of the state. As a country arms itself for war, a family tears itself apart.